Fresh, sweet, spicy and a little sour. Perfection. Here’s an unbelievably fast soup that you can have on the table in about 25 minutes from the time you reach for the refrigerator door. Tamarind pods. The sweet fruit inside is brown and soft. This soup reflects the quote above perfectly, except for the bit about simmering time. I can’t imagine it without a single one of the listed ingredients. It wouldn’t be the same. 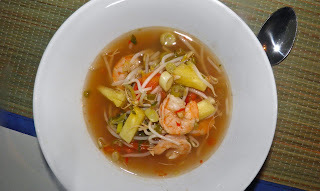 This Vietnamese-inspired soup is my version of one I remember being on the menu of a local Asian restaurant, long since closed. The recipe is simplicity itself, and you only have to bring the soup just to a simmer – not even a boil. Tamarind is an interesting ingredient. An alternate name is “Indian Date.” Just like a date, the pulp is used for cooking. Both the green fruit as well as the fully ripe are used. The green is tart and sour, but it sweetens as it ripens. Tamarind is used in main courses in places as varied as Asia, India and Mexico. 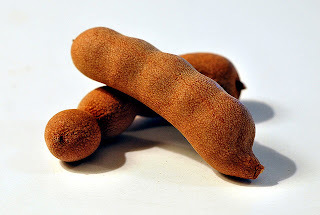 Tamarind is also used in desserts, blended into drinks, ices and ice creams and many other snacks. Here’s one I didn’t know: it’s an ingredient in both Worcestershire and HP sauces. Via the influence of the Victorian British Empire I suppose it shouldn't be that surprising. Pure tamarind sauce may be a little harder to find, but it is available in Halifax at our local Superstores, and at a reasonable price. If you can’t find the bottled sauce buy tamarind in a block at Asian or Indian food stores. Finely dice some “block” tamarind as a substitute. The sauce is, essentially, liquified pulp. But back to the soup. If you want fresh taste look no further. The tomato chunks and green onions are barely softened, the pineapple is just heated through – as is the basil – and the shrimp are just done. No more. This recipe has very, very little fat and carbs. Only what's in the individual ingredients. This is one of my favourite soups. It’s particularly good on rainy days (like today) because of the chilies. The two make for a fairly spicy concoction. be brave and add both. 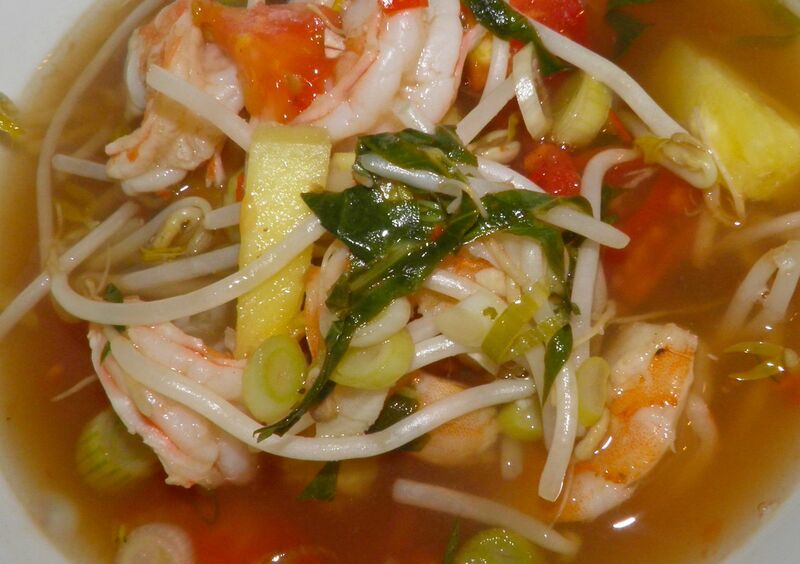 Try this one – but wait for shrimp to go on sale in your locale. I checked the price last night and it made me shudder. Combine the chicken stock, tamarind, fish sauce and garlic cloves in a soup pot over medium heat. Add the chillies, plum tomato, pineapple and green onions. Taste for salt (some stocks are far saltier than others.) Adjust the salt and pepper as you wish. Bring the soup just to a gentle simmer. 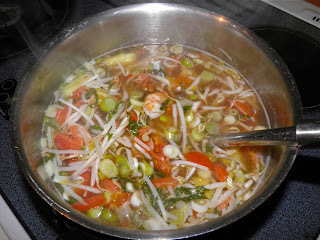 As soon as that happens, add the basil, shrimp and bean sprouts. Let cook only long enough for the shrimp to become opaque. This will be about 3-4 minutes. Any longer and the bean sprouts will wilt and the shrimp will toughen.